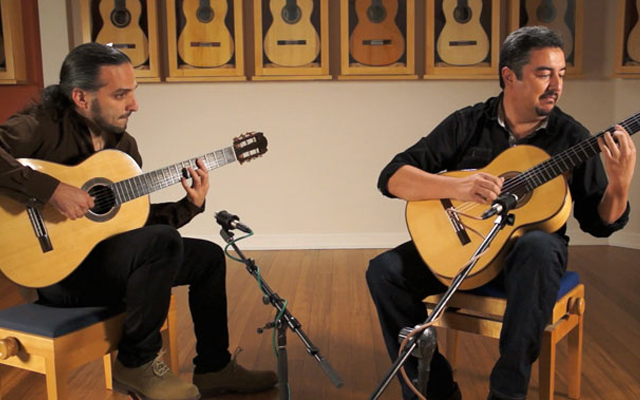 Sometimes wonderfully talented guitarists can be tucked away where you can scarcely hear them until, that is, they happen to get together and produce a disc like this one: Hispanica may not be fraught with meaning, but it certainly gives us more than a passing glimpse of Alfredo Cáceres and Waldo Valenzuela. These are two of a growing breed of guitar masters who are here to present an amazing repertoire of original compositions. The album is dedicated to the great maestro Paco de Lucia. Were he alive today he would surely have welcomed this fragrant bouquet of music with boundless delight. 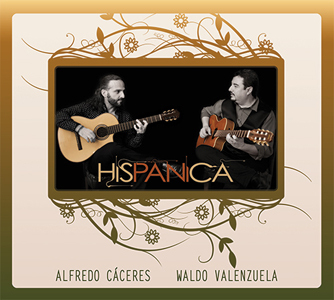 Alternating between guitar and mandola, Alfredo Cáceres, playing Spanish classical and flamenco style brings a colourful, crisp tone to the duo’s exchanges on this album, Hispanica. His palette is full of the fiery emotion of the Spanish and his notes are hurled into the air like the passionate movements of a flamenco dancer. Waldo Valenzuela is no different in that he plays Spanish classical and flamenco style guitar as well. But his tonal palette is very different. His colours have flashes of the red and gold of the Iberian landscape, but there are also brilliant greens and blues as the guitarist seems to lift his notes up to the dense foliage of forests and the azure sky. Together this duo is a formidable one. Each guitarist is a classic virtuoso, and brings exciting accents and dynamic shadings to the music, which is always delightful to the ear of the heart. In Hispanica, the guitarists who have also produced this music have gathered together an impressive list of musicians who add great splendour to the music. Percussionists are like painters adding magnificent colours to the music. The other instruments make for plangent power where this is due and also add upbeat moods to music such as in ‘L.A. Bull’ which is both witty and sinewy, mimicking both the hilarity and gore of the blood sport. Alfredo Cáceres also has a deeply meditative side to his music and brings this to the performance in ‘Cosmic Path II’. 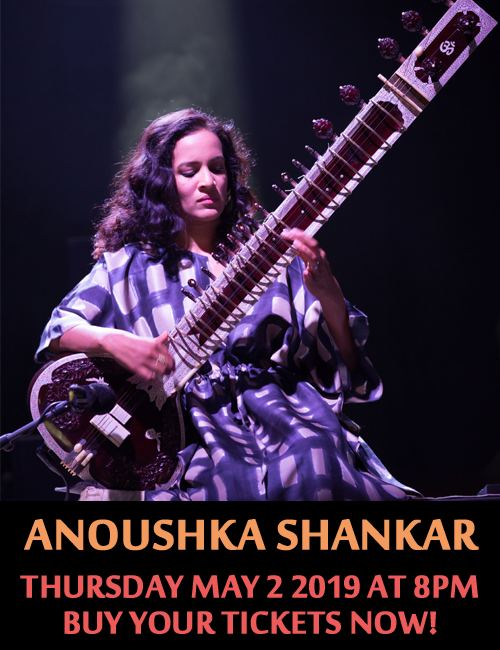 The worldly nature of the music indicates that these musicians have absorbed influences that reach further than Spain and these take them into the heart of Latin America and Brasil. This is exquisitely captured in ‘Rio McBoggie Part II’, a superb song that brings this memorable album to a dramatic close. Track List: Six Times Two; La Cuidad de los Sueños; Pepi; L.A. Bull; De La Camargue a Paris; Del Sur; Si esto es amor; Cosmic Path Part II; Arce; Calle Niebla; Rio McBoggie Part II. Personnel: Alfredo Cáceres: guitars, mandola, percussion; Waldo Valenzuela: guitars; George Reyes: vocals; Michael O’Neill: electric guitar; Jorge Struntz: Spanish guitar; Dimitris Mahlis: oud; Joey Heredia: drums; Alfredo López: basses; Marco Rentería: bass; Christian Moraga: percussion; Gino Gamboa: percussion; Leo Chelyapov: clarinet; Sal Ojeda: drums; Eliseo Borrero: bass; Jamie Papish: percussion; Patricio Castillo: vocals; Mario César Oretea: guitar; Marcelo Córdova: bass; Matías Alvear: bass; Carlos Vivas: piano; Dan Tal López: percussion; Arturo “Turra” Medina: percussion, palmas.